Heidemarie of Chocolate Harmony has proven that she is the queen of all things chocolate, but did you know she’s also got some other amazing recipes up her sleeve? 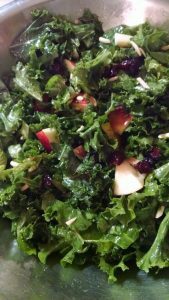 See her Kale & Apple Salad recipe below, which is perfect for in-season kale and those apples preserved from the winter harvest. Both are currently available at the market! Whisk together the lemon juice, olive oil and 1/4 teaspoon salt in a large bowl. Add the kale, toss to coat and let stand 10 minutes. While the kale stands, cut the apple into thin matchsticks or chop. Add the cranberries, apples, almonds and cheese to the kale. Season with salt and pepper and toss well.